I have been reading about piezonuclear radiation as applied to the Shroud of Turin. I noticed your note at the side . . . Portrayal of the top of the man’s head: There are two images on the sheet, showing a man’s back and front. That is because this burial shroud was apparently wrapped from the the man’s feet, up the front of his body, over his head, and down his back to his feet. The front and back images of the head are separated by a gap of less than 1 cm (less than a half inch). Some investigators have suggested that the image on the shroud was caused by some form of radiation emanating from the body, perhaps at about the time of death. This leads immediately to what might be called the "top of the head" problem. 1) There was similar radiation from the top of the head. It would have left an image of the top of the victim’s head on the shroud. However, there is no such image. Only a tiny gap is seen. 2) There was no radiation from the top of the head. This would result in a dark gap of perhaps 12 cm (almost 5 inches) between the top of the front of the head and the top of the back of the head. No such gap is visible. Thus the radiation theory seems to fail because it does not match the image. 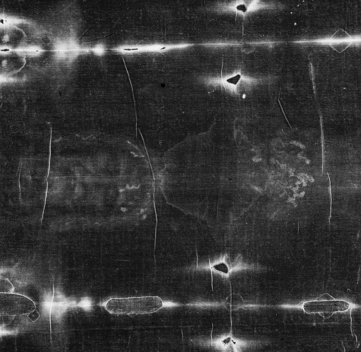 That still leaves the possibility that the Shroud is some form of image intentionally created — either as a painting by an artist or by some form of photographic technique. 1) The shroud was created as a forgery that was to be "sold" to the public as Jesus’ shroud. This seems improbable because the "top of the head" problem would immediately point out that this is not a real 1st century shroud. 2) The shroud was created by a human as a type of icon to be venerated. This seems to be the most likely possibility. 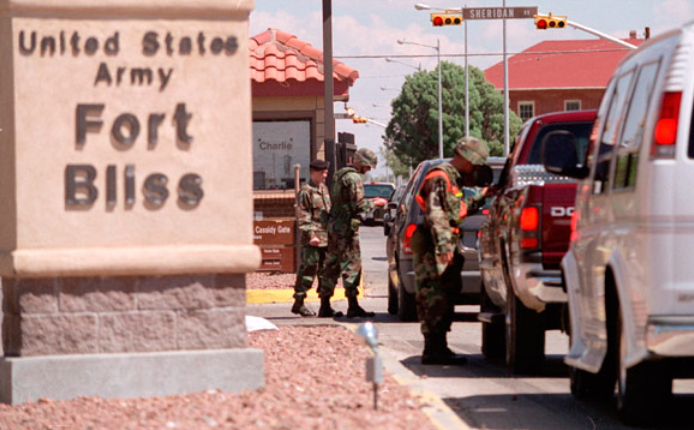 Fort Bliss, TX – Fort Bliss hopes to educate and inform those interested in learning more about Shroud of Turin. The army base will host two different information sessions on Saturday, March 8th at 311, Pershing Circle, West Fort Bliss. The event is sponsored by the Chaplains Office. This is the first time a presentation on this topic has been held at Fort Bliss. The event is presented by Shroud Researcher, Deacon Pete Schumacher. This event is free and open to the public. Attendees may bring a sack lunch if they decide to attend for both sessions. (ANSA) – Turin, February 27 – The mysterious Shroud of Turin will be exhibited for an unprecedented 67 days next year, the office that keeps what Catholics revere as Christ’s winding sheet said Thursday. From April 19 to June 24, 2015 the shroud that is believed by many faithful to bear the image of a dead Jesus will be on display. 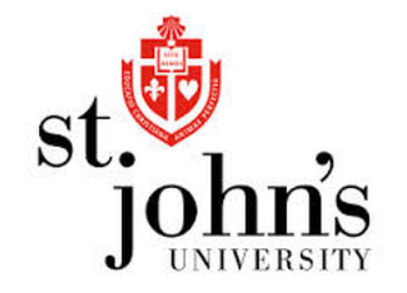 The unusually long showing is because it will coincide with the bicentenary of the birth of Catholic educator and slum reformer Saint John Bosco and with a visit by Pope Francis whose exact date has yet to be established, the Shroud office said. June 24 is the feast day of Turin’s patron saint St John the Baptist, as well as the name day of Don Bosco, as he is more commonly known. Before then, it had been on view in 2000 and has been on display only five times in the past 100 years. Believers say the linen Shroud was used to wrap the body of Christ after his crucifixion and countless scientific tests conducted over the years have revealed the outline of the body of a man embedded in the fabric. The Shroud is normally heavily guarded in a bullet-proof, climate-controlled glass case within Turin’s most important cathedral. Only once before had images of the Shroud been broadcast as ordered in November 1973 by then-pope Paul VI. The dates of the exposition Don Roberto Gottardo presented the dates indicated by the custodian for the exposition of 2015, that the Council approved. The exposition will be held from Sunday 19 April to Wednesday 24 June, feast of Saint John the Baptist, patron saint of Turin and Saint of don Bosco. The longer period (67 days) than that of other exposures of the cloth; but you wanted to, in this way, provide the period most broad possible both for the Pope’s visit for the pilgrimage to the Shroud of the young people who will participate in the various celebrations of the Jubilee salesiano. Known as Papa Francesco assured his presence in Turin to venerate the Shroud and honor the memory of don Bosco in the bicentenary of the birth; but have not been given precise dates for his visit. I’ll be working with Canterbury Tours again, as I did in 1998, 2000 and 2010. Now that the dates are confirmed we will start making specific plans. Keep watching for more details in the near future. Apollonius of Tyana: Proof or Doom for Christianity? Rob Solarion [pictured] puts two and two together and proposes a revolutionary theory: The man on the Shroud is actually Apollonius of Tyana and so the story of Jesus is actually a missing chapter of his life! Ιncidentally, that supports the theory that Jesus did not die on the cross, something hinted in the Gospels too. Is this possible? So far, without reading the book, I see no evidence other than a rather suspect comparison of the face image from the shroud and a maybe-undated statue of Apollonius of Tyana. Wikipedia suggests (or does it?) that the statue might be late second century. Yeah, that will work! BTW: The facial comparisons in the blog Apollonius of Tyana and The Shroud of Turin posting are dubious, at best. 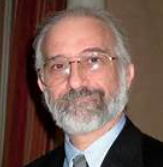 Though Jewish, Schwortz found his research on the shroud a transformational experience. He was originally reluctant to join STURP. 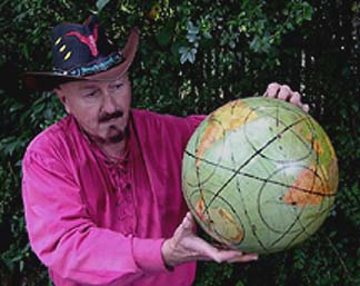 By the time the original study concluded, however, he felt his work remained unfinished. In 1995, he met someone who insisted the shroud was a fake—based largely on a tabloid article. The encounter compelled Schwortz to examine his own perspectives on the cloth: he realized that he believed in its authenticity. Schwortz went on to found http://www.shroud.com, the top Google search and oldest website on the topic. 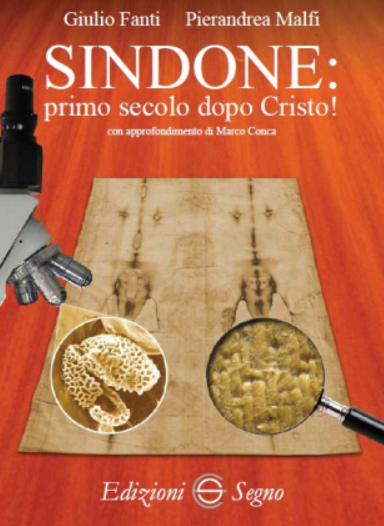 Yesterday, publisher Edizioni Segno launched LA SINDONE: primo secolo dopo Cristo! (Turin Shroud: First Century A.D.!) by Giulio Fanti and Pierandrea Malfi. 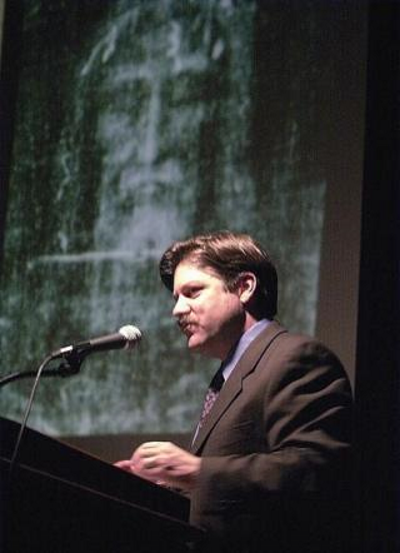 Russ Breault was writing for his college’s student newspaper in 1980 when he was hooked by the mystery of the Shroud of Turin, and decided to write a story about it. He went on to work in advertising, but the pull of the religious icon never left him. And he’s never found a definitive answer to its central question: Did the shroud once wrap the body of Jesus of Nazareth? He said the Catholic Church has not claimed it to be either. Instead, the church calls it an object of veneration, a reminder of Jesus’ suffering, because its wearer was apparently scourged and crucified. “It’s in the heart of the individual believer, if you want to believe it’s authentic or not,” he said. Breault isn’t a chemist or a forensic pathologist, but he’s familiar with their work. He said scientific analysis has shown that the shroud belongs to someone with puncture wounds indicating its wearer was crucified, as evidenced by the blood stains. Most tellingly to Breault, the shroud has markings consistent with the crown of thorns, the mocking punishment meted out to the man who some called the king of the Jews. But attendees to his talk should have plenty of facts to defend whichever side they choose. Radiocarbon dating completed in 1988 could have put these questions to rest. They have not. Though the tests showed that the shroud originated between 1260 and 1390, the testing took one sample from a corner, Breault said. They should have taken three patches from different parts of the material. Moreover, the corner they chose is chemically different from the rest of the garment. Further tests completed last year by a team from Padua University dated the shroud between 280 B.C. and 220 A.D.
He’s also bringing what he said is a museum-quality reproduction of the shroud. And even if the shroud didn’t wrap the body of Jesus, doesn’t its centuries-old lineage and veneration make it an object of wonder? Breault agrees, to a point.